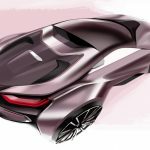 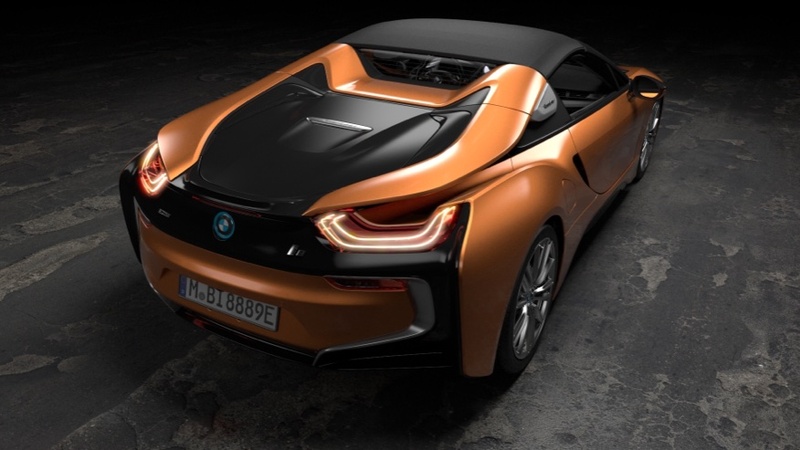 Today BMW takes th wraps off of the long awaited BMW i8 Roadster and updated coupe. 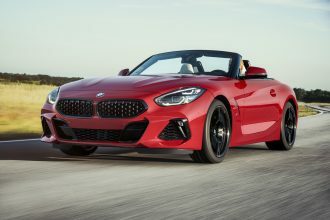 The revisions aren’t massive to the coupe (read on below) so the big story here is the Roadster and the re-engineering Effort that went into it. 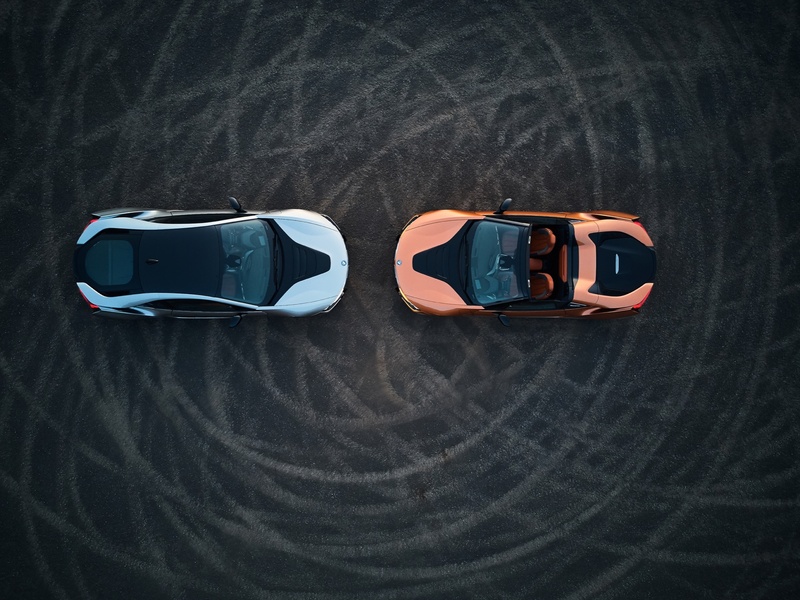 To our eyes the results are breathtaking. 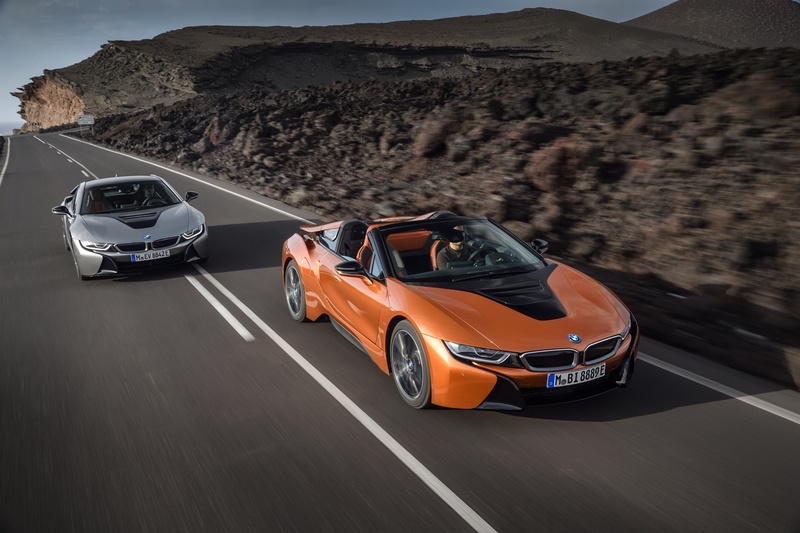 The moment you see the i8 Roadster you wonder why the coupe ever even existed. 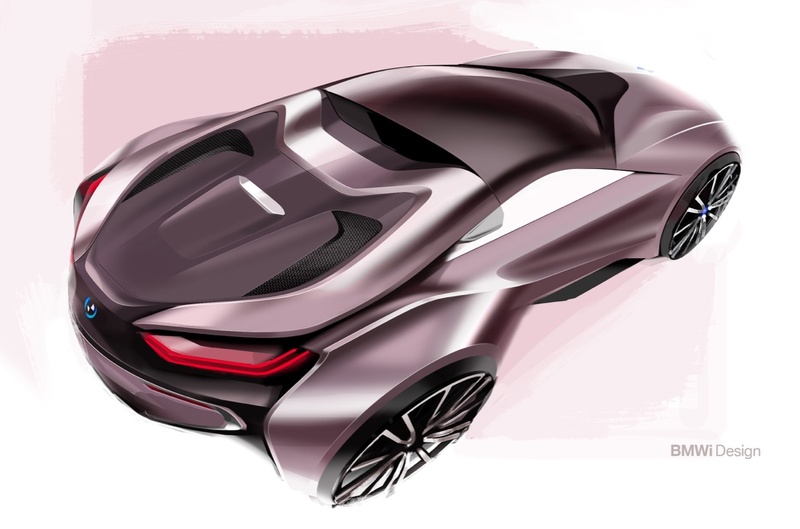 Granted it’s a lighter slightly more capable vehicle. 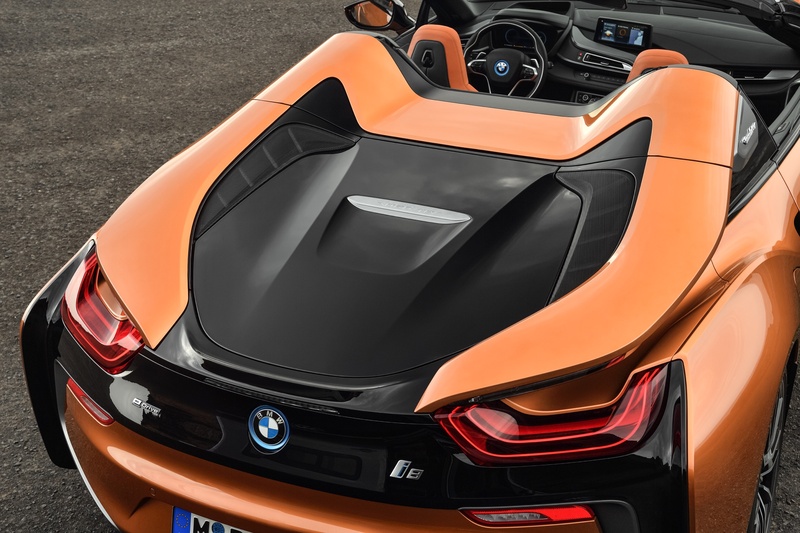 But the look and the feel that th roadster gives you is on another level. 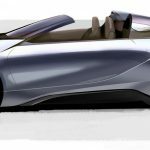 We’ll have much more on the Roadster in the coming days. 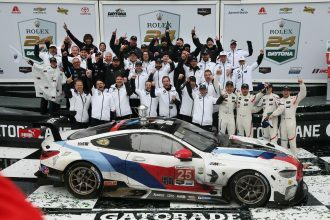 Until then here’s the high level executive summary on what you should know and the full release on everything else. 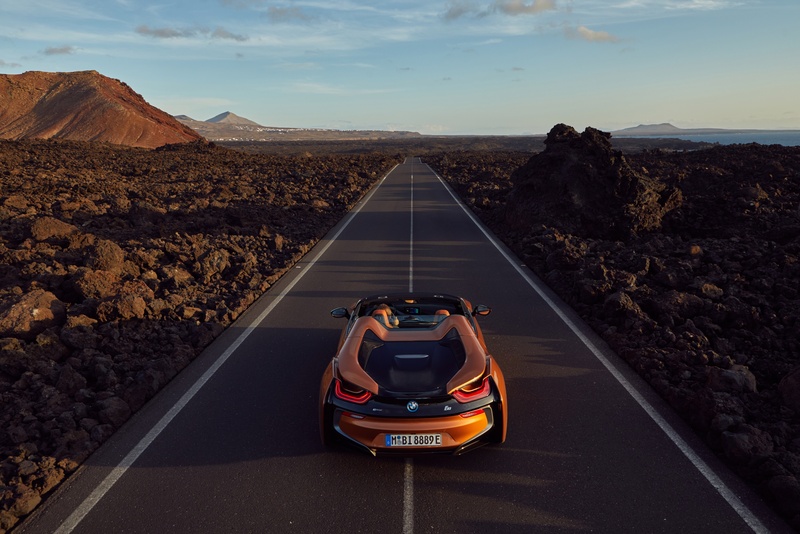 Official release: Today, the allure of sustainable driving is poised to enter another new dimension as BMW introduced the first-ever BMW i8 Roadster matching BMW eDrive technology with the Ultimate Driving Machine. 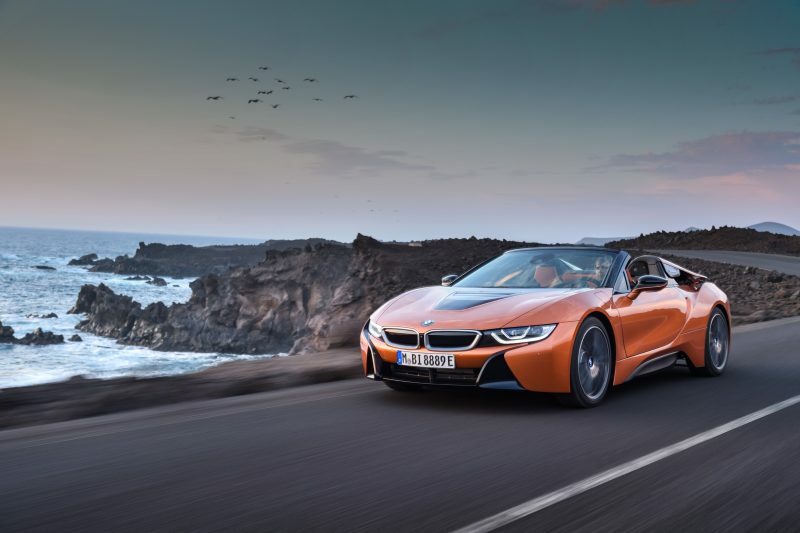 The first-ever BMW i8 Roadster takes the BMW i8’s combination of locally emission-free mobility, high-caliber performance and adds the top- down driving experience. 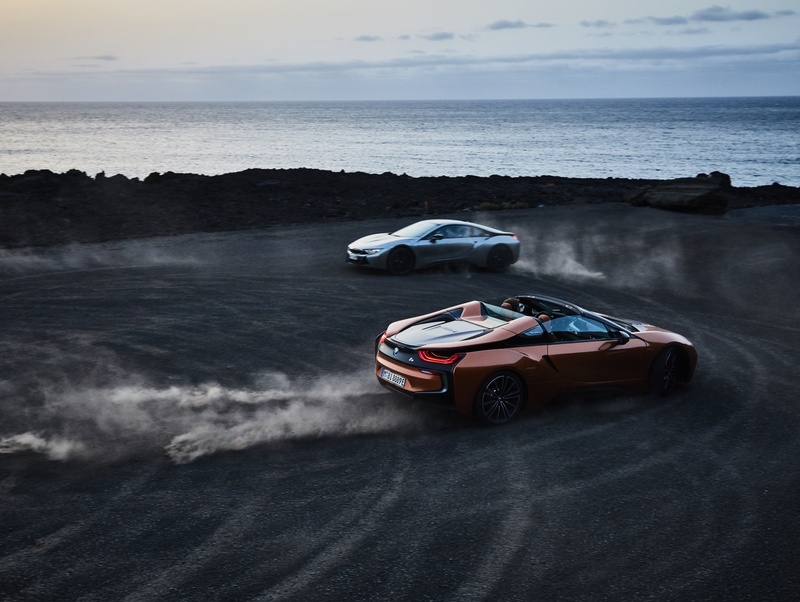 The Roadster offers a whole new sensation of freedom, opening the door to virtually silent driving with zero CO2 emissions and bringing an extra edge of purity to open-air driving. 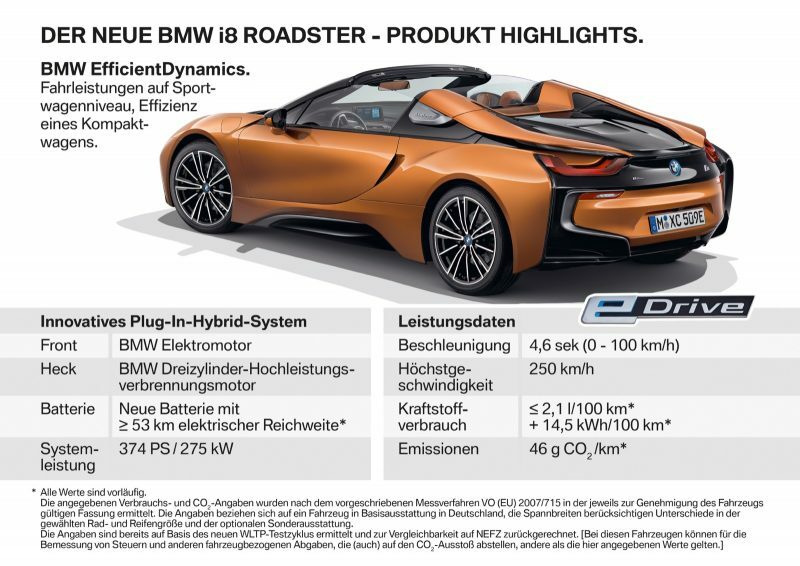 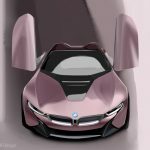 An optimized BMW eDrive technology means more power – total output increased to 369 hp (+12 hp), a refined high-voltage battery with increased capacity and range, the first-ever BMW i8 Roadster and BMW i8 Coupe can cover up to 18 miles (preliminary) in purely electric driving. 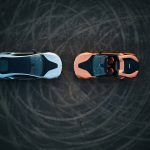 With hybrid-specific all-wheel drive, combustion engine driving the rear wheels and the electric motor driving the front wheels, acceleration 0 to 60 mph takes just 4.2/4.4 seconds (preliminary) Coupe and Roadster respectively with both reaching an electronically limited top speed of 155 mph. 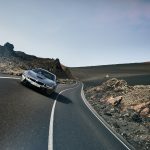 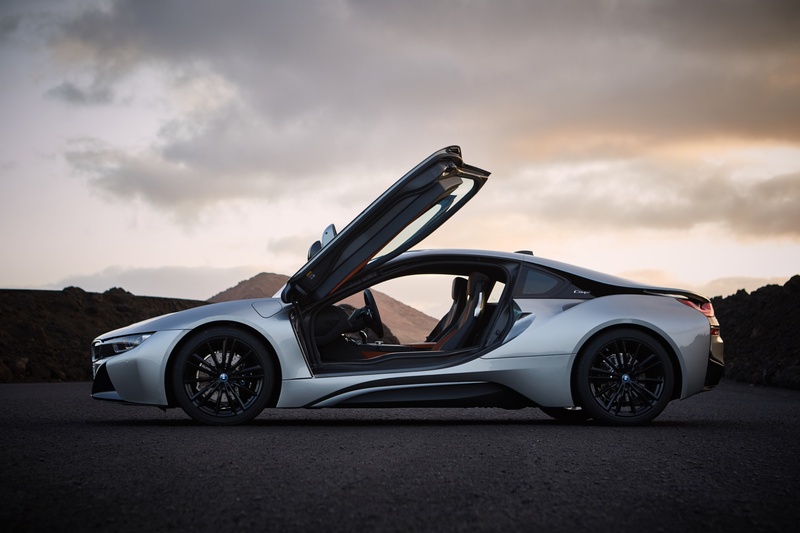 The BMW i8 has performed the role of sports car of the future with extraordinary success since 2014. 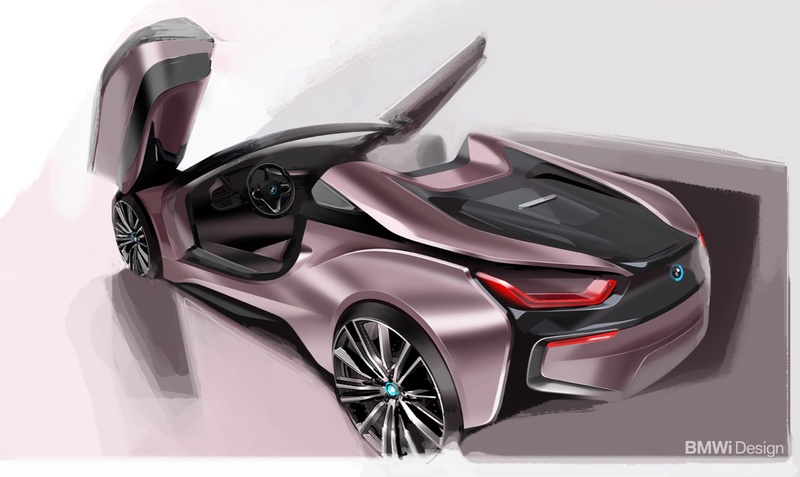 The progressively designed 2+2-seater doubles up as an eye-catching object of desire and a technological pioneer. 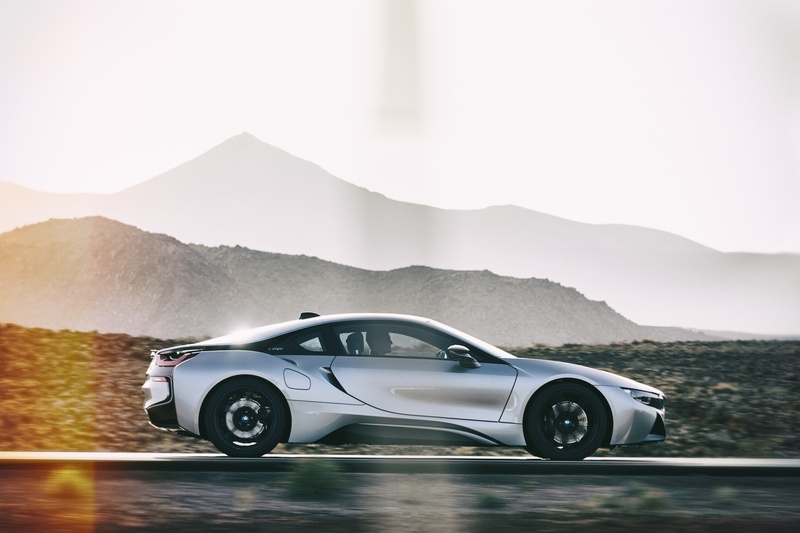 Indeed, the BMW i8 has been the world’s best-selling hybrid sports car since it first hit the roads in 2014 and has collected an array of awards in recognition of its visionary design and trailblazing vehicle concept. 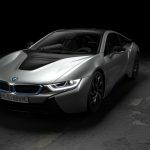 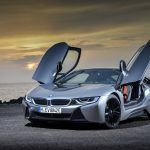 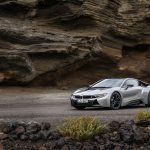 The BMW i8’s plug-in hybrid drive system has won the International Engine of the Year Award three years in succession (2015 – 2017) and paved the way for the constantly expanding number of plug- in hybrid models from the BMW and MINI brands. 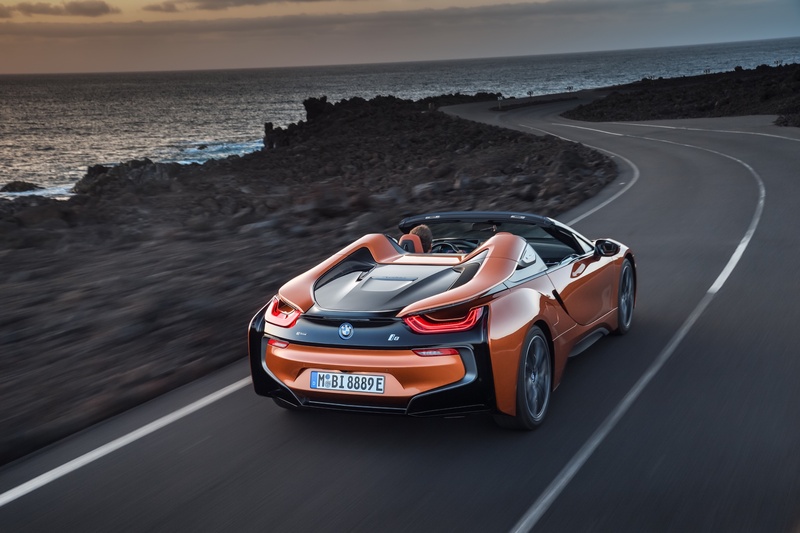 The BMW i8 Roadster: two-seater with electrically operated soft-top roof and additional on-board storage space. 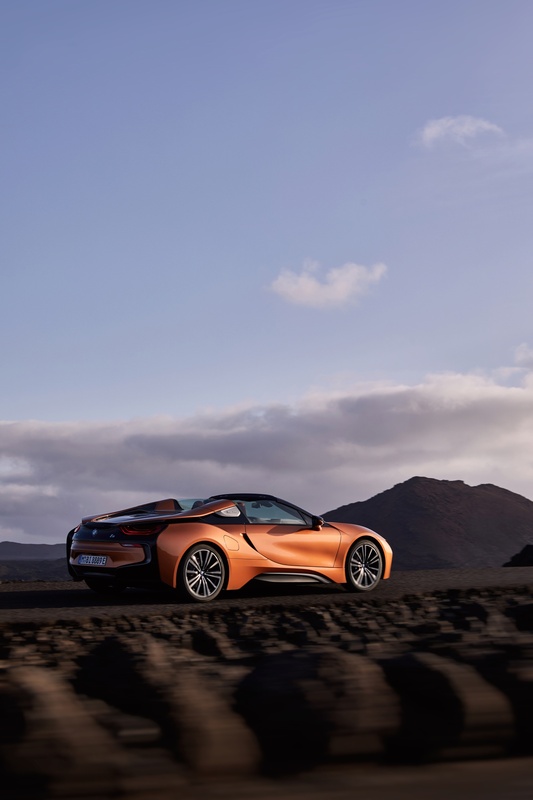 Passengers inside the first-ever BMW i8 Roadster can either enjoy the open sky or a high- quality, all-season fabric soft-top with additional soundproofing. 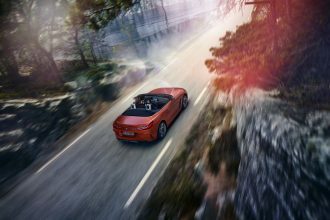 The electrically operated convertible top, opens and closes in less than 16 seconds and while the vehicle is in motion at up to 31 mph. 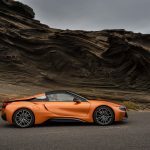 The BMW i8 Roadster is alone among its rivals in offering owners a fabric soft-top which stows away into a perpendicular position in the rear when opened and therefore takes up very little space. 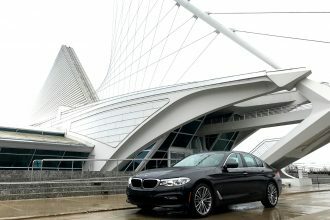 The three segments of the roof fold vertically in a ‘Z’. 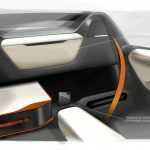 Additional storage space between the roof box and the seats for the driver and front passenger is around 3.5 ft3 (preliminary figure). 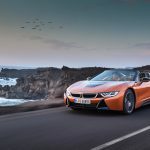 In combination with the storage area in the rear, which can accommodate 4.7 ft3 cargo, the rear compartment helps to ensure the open-top version of the plug-in hybrid sports car is also as well equipped as possible for everyday use. 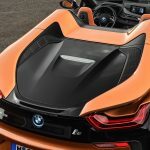 Intelligent lightweight design and innovative production technology also play a key role in the construction of the soft-top. 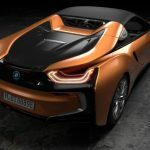 For example, aluminum elements connecting the roof mechanism with the body of the first-ever BMW i8 Roadster are produced in a new 3D printing process. 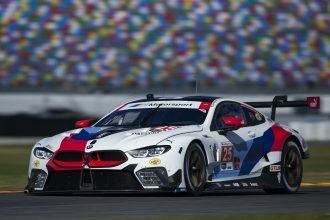 This manufacturing method for aluminum components breaks new ground in the automotive industry and allows the topologically optimized bracings to be produced in a geometric form, which would not be possible using conventional casting techniques and ensures an optimal balance between component rigidity and weight. 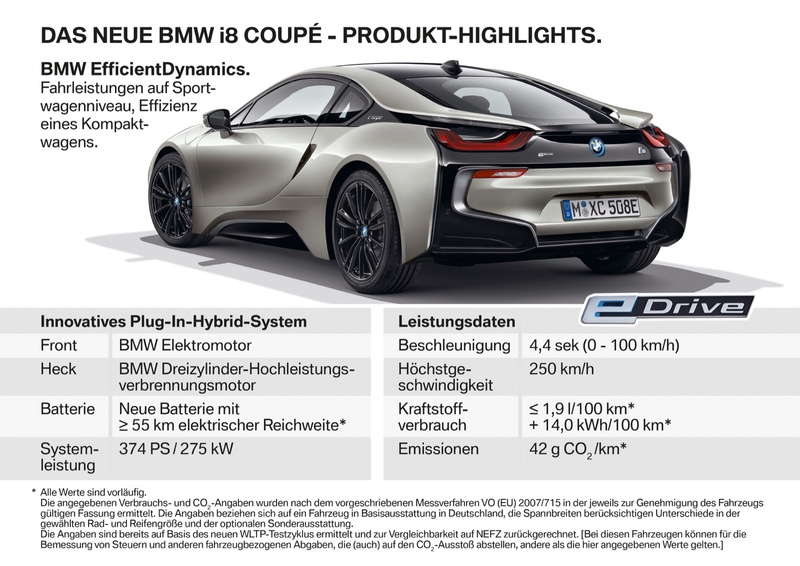 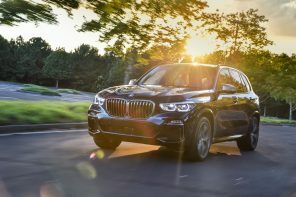 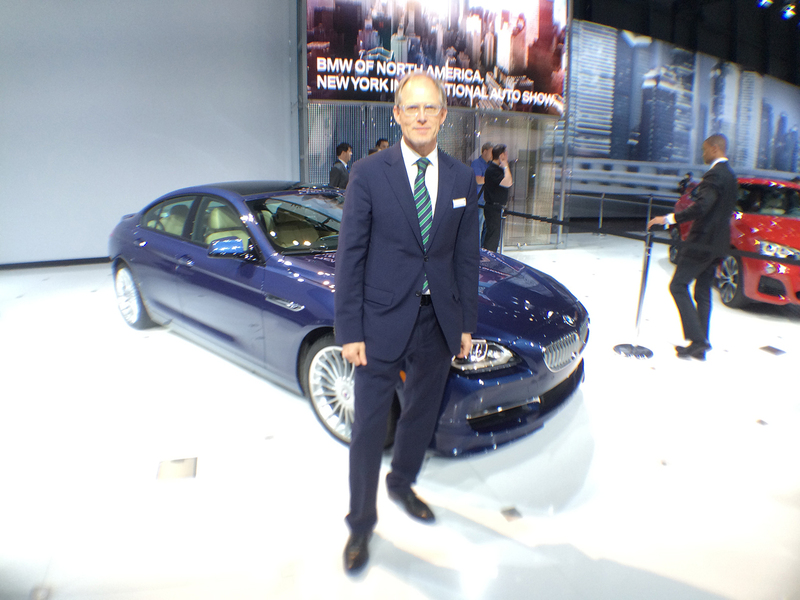 Optimized BMW eDrive technology: more power, increased range; electric driving experience raised another notch. 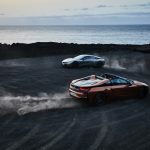 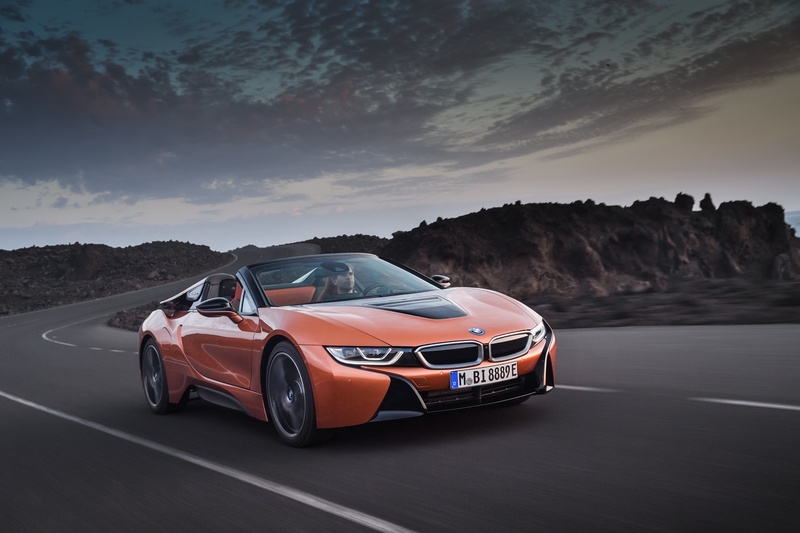 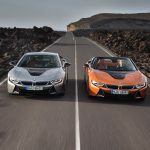 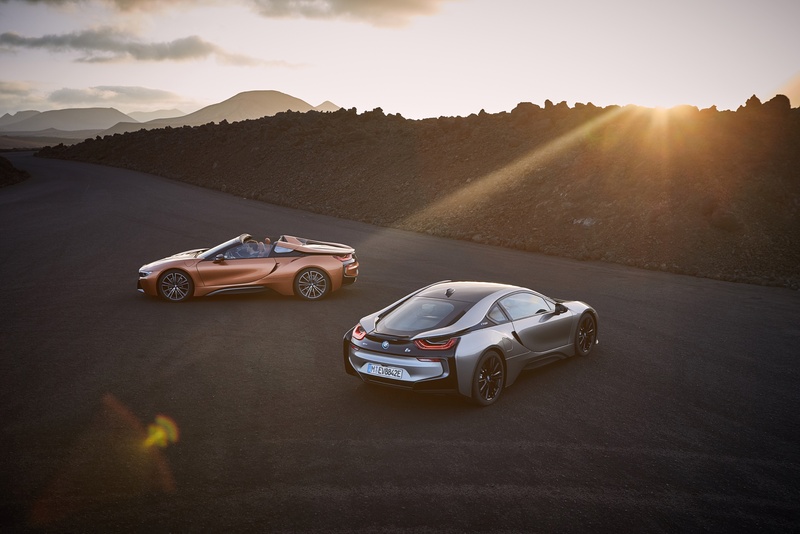 Rigorously developed BMW eDrive technology powers both the first-ever BMW i8 Roadster and new BMW i8 Coupe. 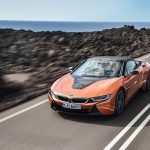 The number of driving situations where the electric motor is solely responsible for powering the car has been significantly increased. 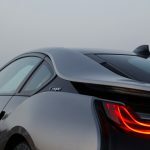 By contrast, the combustion engine is only brought into play when accelerating hard, and is switched off again far more frequently with a measured driving style. 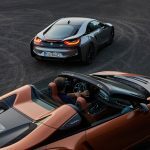 The optimized operating strategy of the intelligent energy management highlights the future-focused character of the new BMW i8 Coupe and ensures that drivers of the first-ever BMW i8 Roadster can enjoy silent open-top driving with zero local emissions. 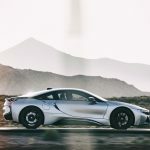 Underpinning this new level of locally emission-free electric mobility is the updated version of the lithium-ion battery developed for the BMW i8. 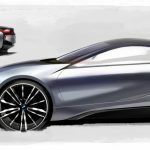 The high-voltage unit is located centrally in the car’s underbody and its cell capacity is up from 20 to 34 Ah and gross energy capacity from 7.1 to 11.6 kilowatt hours (kWh, net energy capacity: 9.4 kWh). 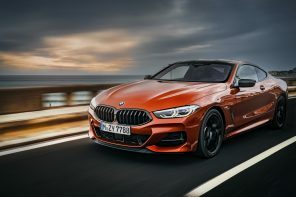 Plus, the cell configuration allows a 12 hp increase in peak output to 141 hp and 184 lb-ft of torque, lacing quick sprints on pure-electric power with an even sharper streak of dynamism. 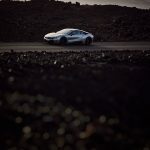 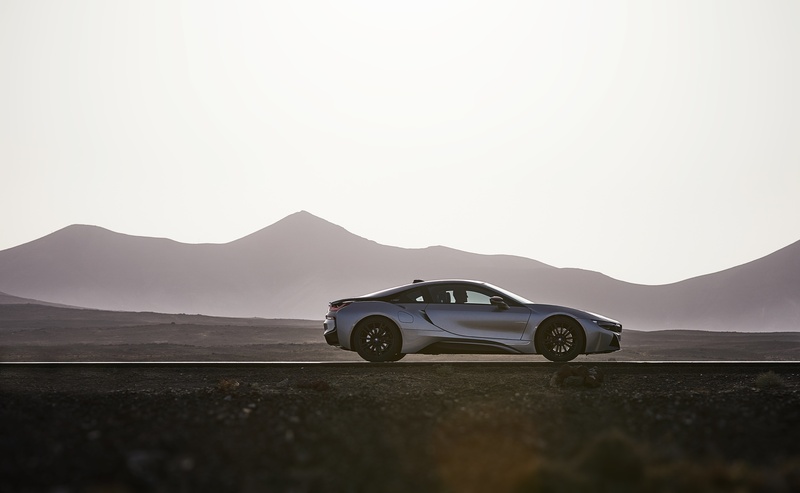 The BMW i8 is the world’s first sports car to be developed from the outset primarily under the banner of sustainability. 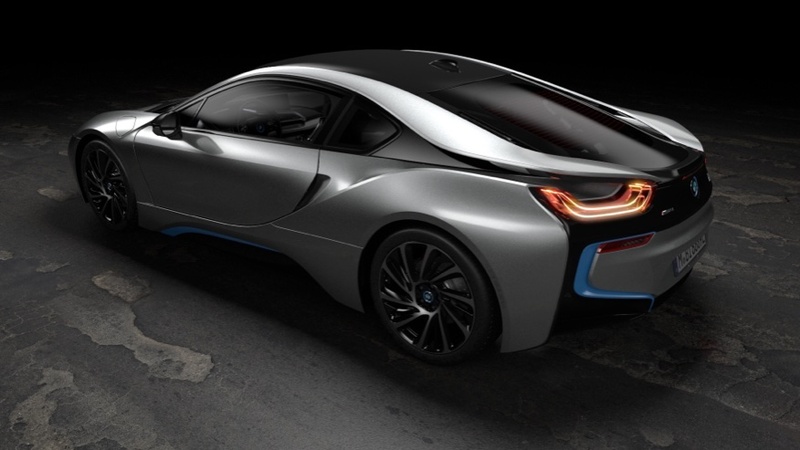 Groundbreaking lightweight design, systematic improvement of aerodynamics and advanced plug-in hybrid technology. 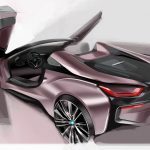 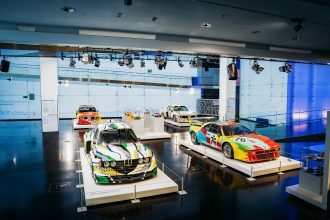 The framework for the concept’s implementation was provided by the brand new LifeDrive vehicle architecture for BMW i models, whose horizontally split structure comprising an aluminum chassis and a CFRP passenger cell offers an exceptional degree of design freedom. 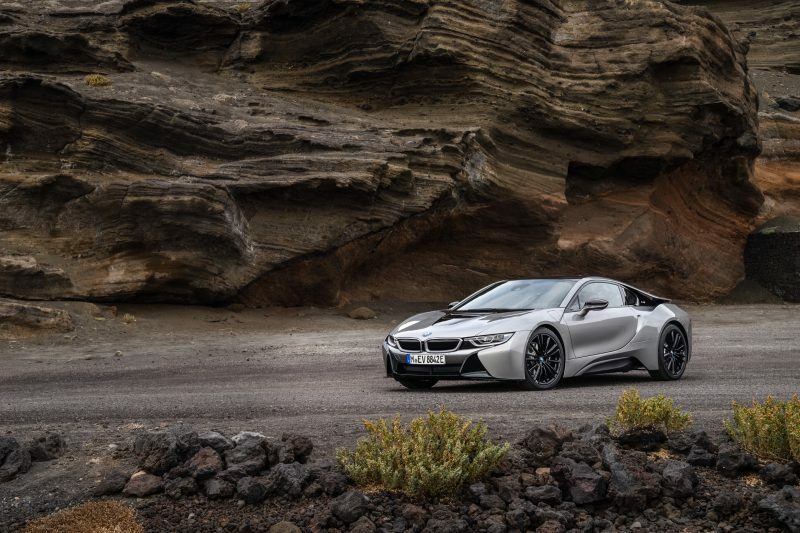 The visionary styling of the BMW i8 Coupe therefore succeeds in expressing not just the car’s dynamic performance credentials, but also its outstanding efficiency. 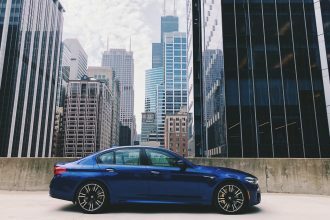 A string of prestigious accolades, including the iF Design Award and the Red Dot Award, testify to the design’s quality and allure. 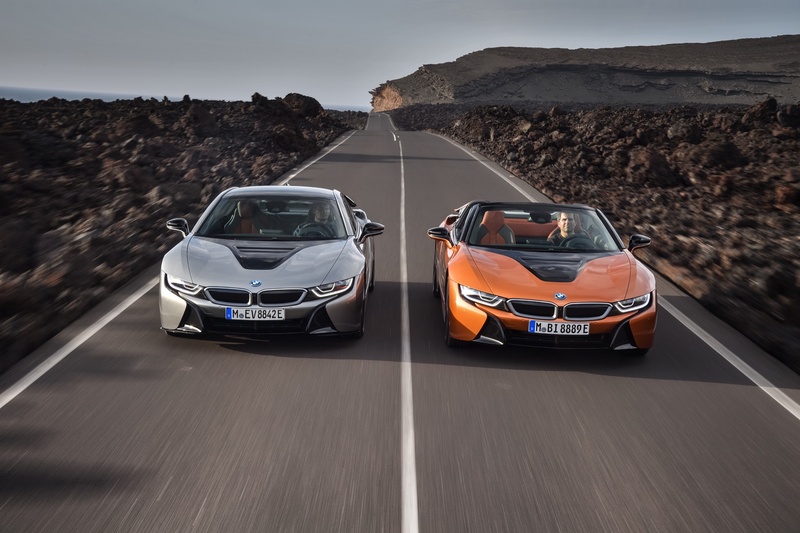 And the BMW i8 Roadster translates the unmistakable BMW i design language to another vehicle concept, fusing the dynamic proportions of the i8 with signature roadster features to give it a character all of its own. 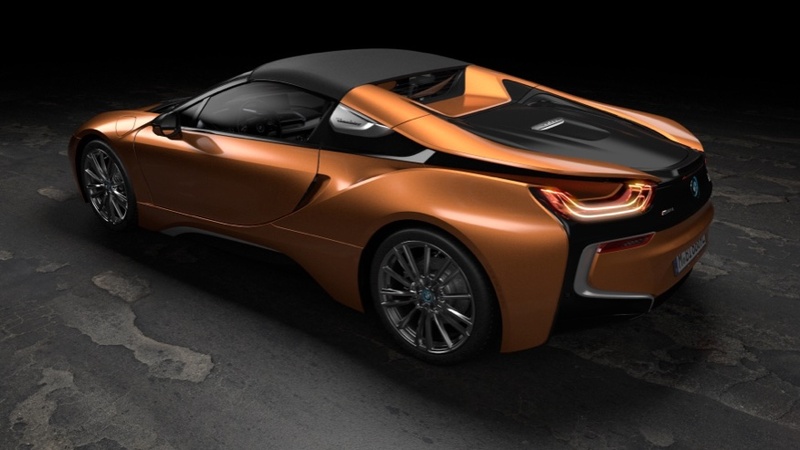 The design of the BMW i8 Roadster is awash with individual highlights that radiate elegance. 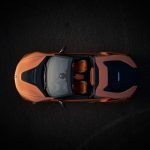 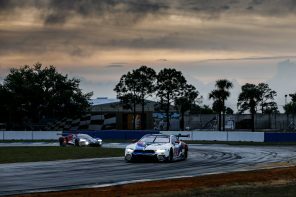 The soft-top roof has a visual lightness to go with its low physical weight and serves as a defining element of the silhouette in reinforcing the road-hugging impression made by the car’s low center of gravity. 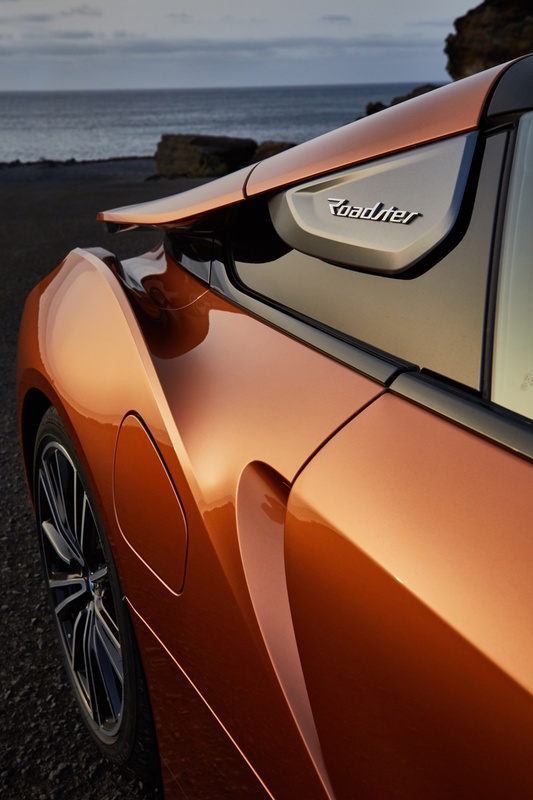 The body’s dynamic wedge shape can also be best appreciated when viewing the two-seater in profile. 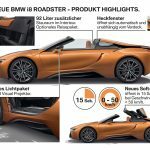 The B-pillars of the first-ever BMW i8 Roadster are emblazoned with beautifully made model-specific badges bearing the inscription “Roadster”. 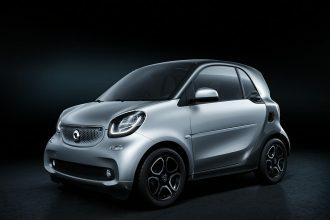 A similar logo can be found on the tail of the sporty two-seater. 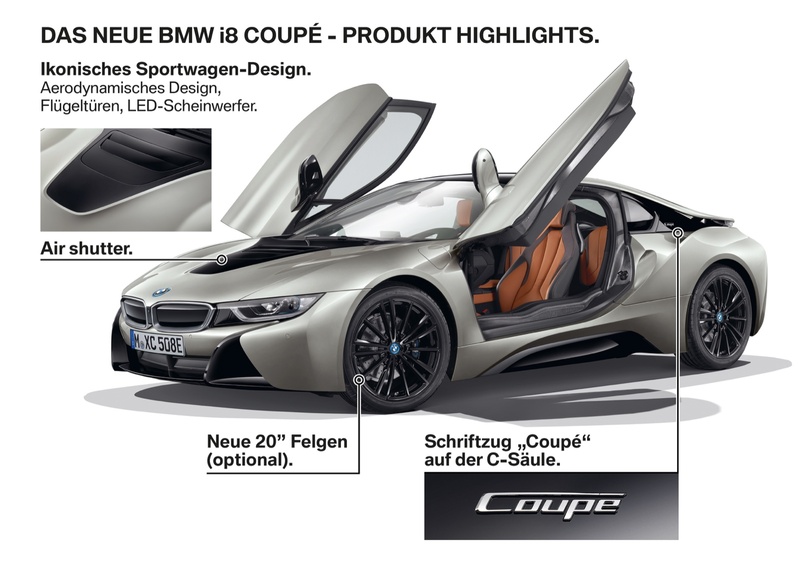 New exterior paint finishes, exclusive light-alloy wheels. 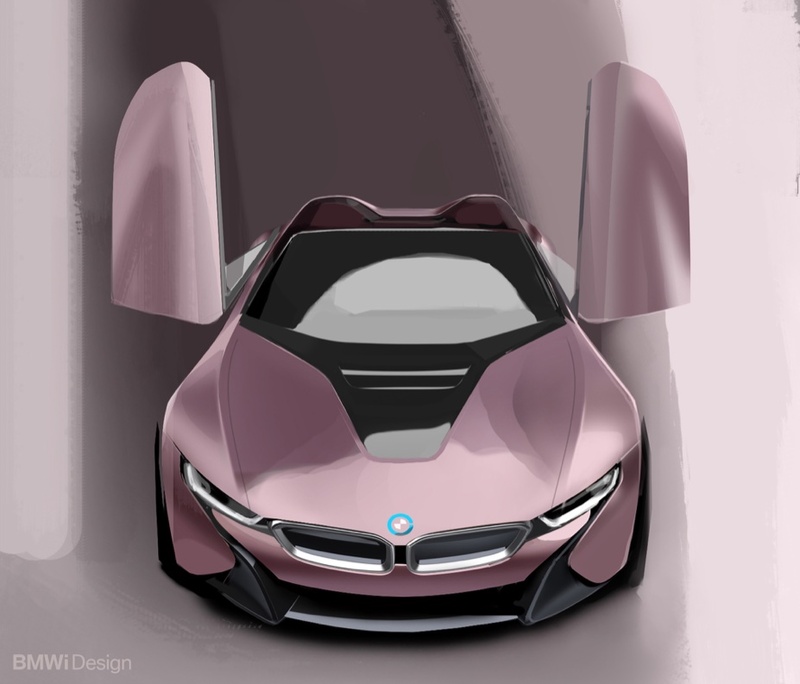 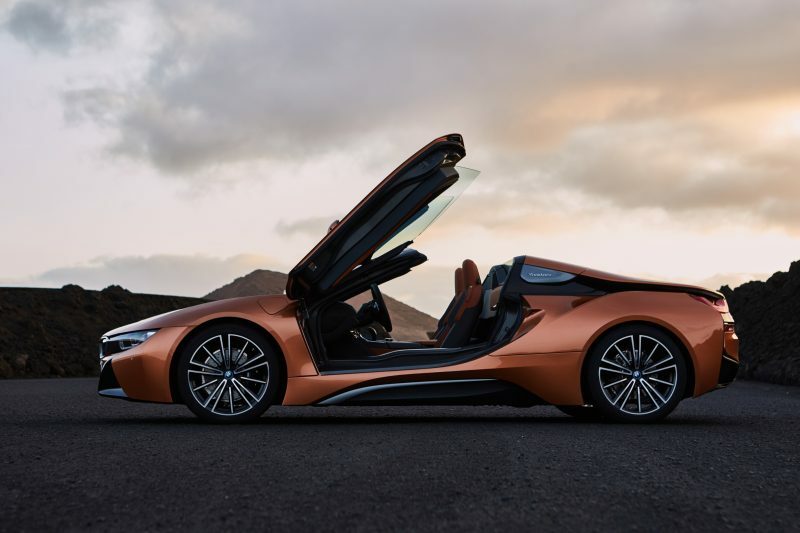 The design cues common to both the new BMW i8 Coupe and first-ever BMW i8 Roadster include the gullwing doors that open forwards and upwards as well as optimized aerodynamics. 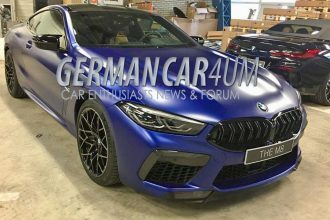 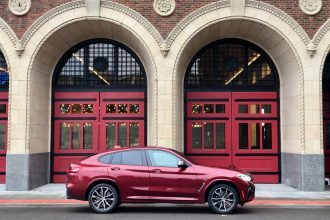 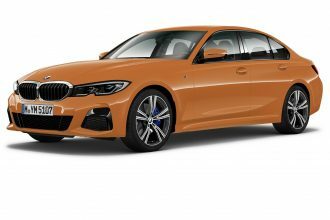 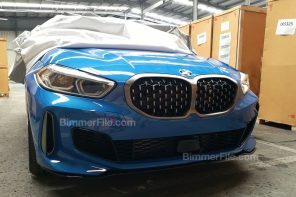 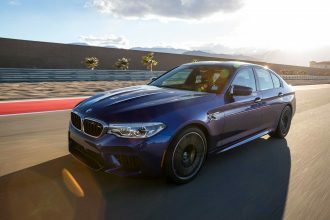 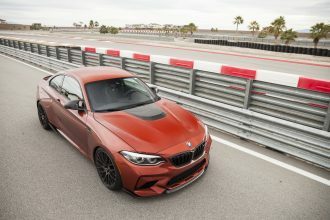 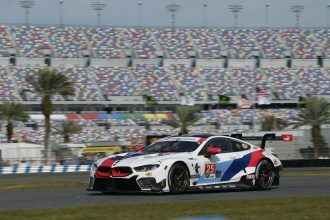 The low hood, BMW kidney grille, air flap control system, Air Curtains in the front apron, flat underbody, contoured side skirts, “stream flow” lines of the car’s flanks, and air ducts between the rear lights and roof frame allow the air to be guided effectively. 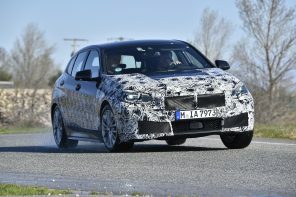 The flow of cooling air at the front of each model has now been re-routed. 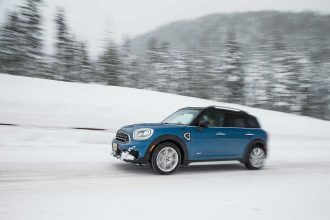 Instead of rushing out through the outlet in the hood, the air escapes at the sides of the car near the wheel arches and into the underbody. This ensures a pleasant cabin temperature is maintained at all times, especially when travelling in the first-ever BMW i8 Roadster with the roof down. 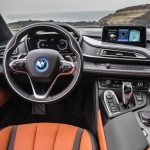 The progressive style of the BMW i8 Coupe and first-ever BMW i8 Roadster also shines through clearly in their interior design. 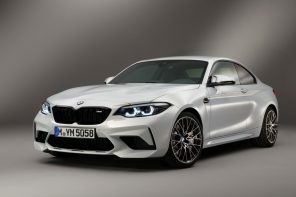 Standard specification for both models includes a sports steering wheel and multifunctional instrument display, plus Giga interior trim comprising full-leather upholstery in Ivory White for the Coupe and Ivory White/Black for the Roadster. 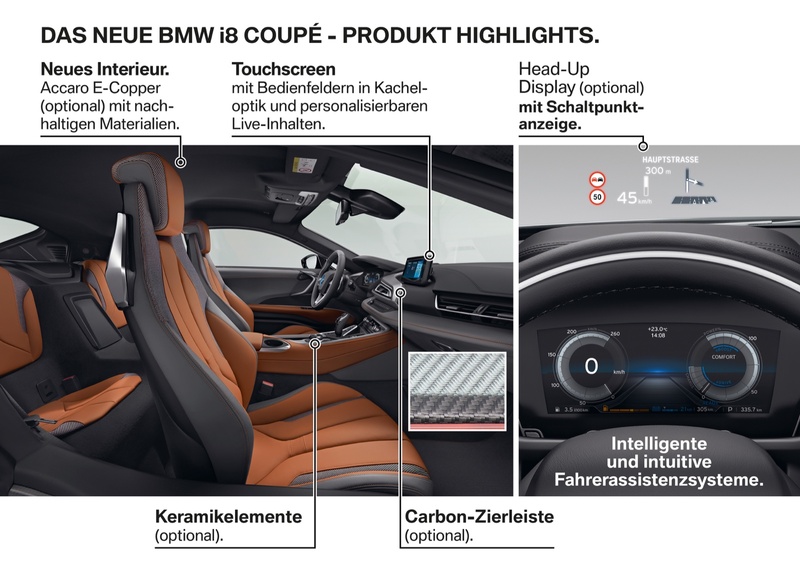 Giga interior trim can alternatively be specified in dark Amido for both models and there is also the option of Halo interior trim featuring cloth/leather upholstery in a Carum/Dalbergia color scheme. 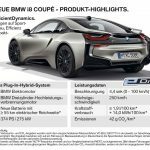 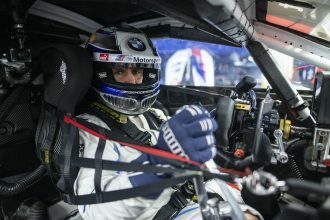 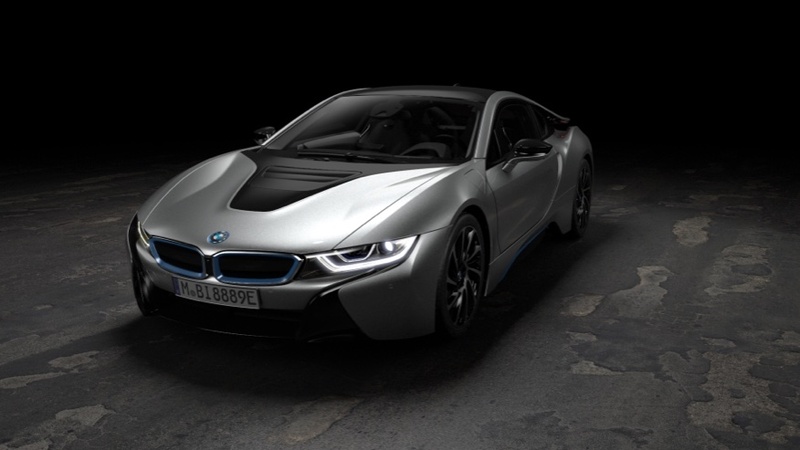 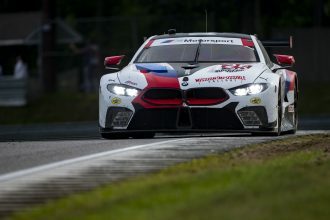 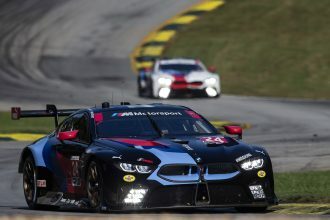 With its intoxicating blend of advanced BMW eDrive technology, BMW TwinPower Turbo technology internal combustion engine, sophisticated chassis technology, hybrid-specific all-wheel drive and rigorously applied lightweight design measures, the BMW i8 has come to epitomize the future of the Ultimate Driving Machine. 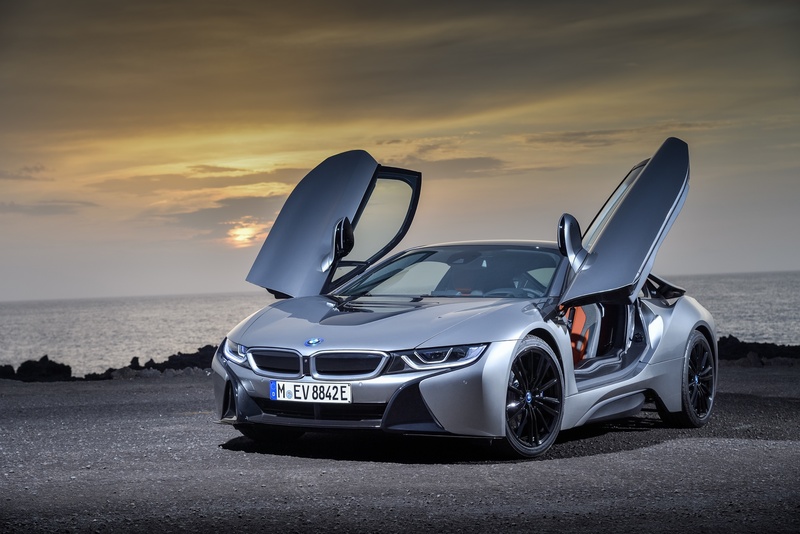 Since its market debut in 2014, it has established itself as the world’s highest-selling plug-in hybrid sports car. 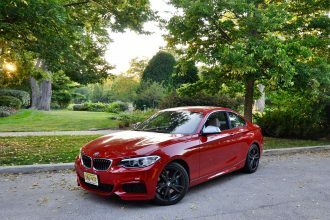 It succeeds in melding sports car performance qualities with the sort of fuel economy and emissions usually associated with compact models. 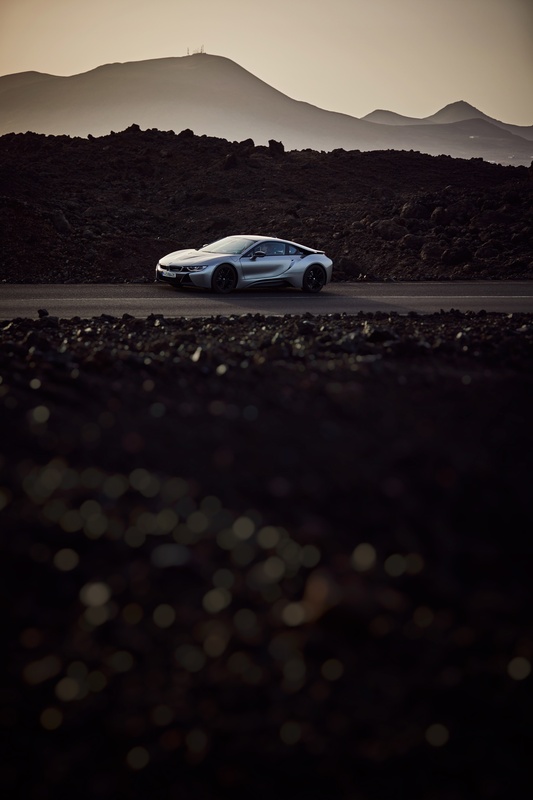 The LifeDrive architecture, meanwhile, ensures a perfect distribution of weight. A refined high-voltage battery and an electric motor with more power. 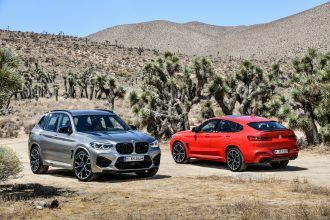 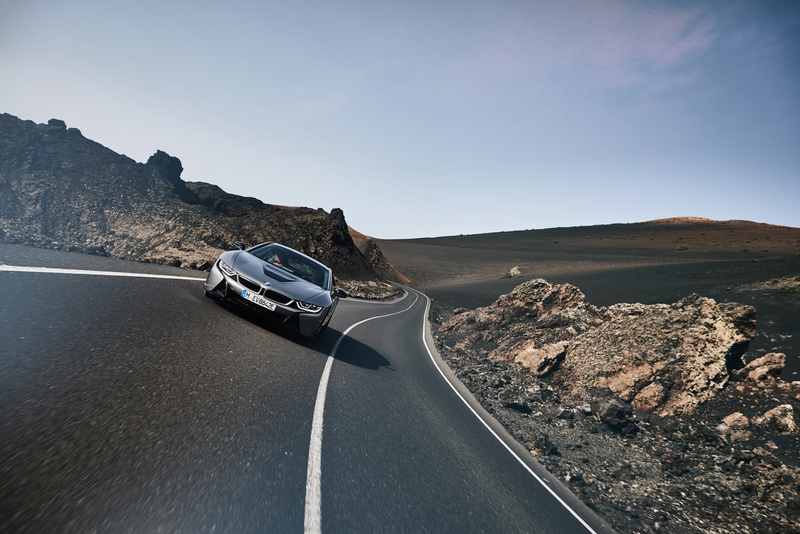 The constant process of development has enhanced the performance capabilities offered by BMW’s eDrive technology. 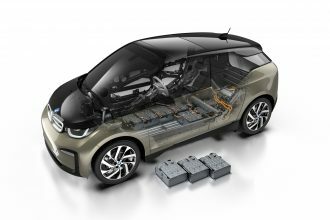 The energy capacity of the latest version of the model- specific lithium-ion battery is far greater, battery cell capacity having increased from 20 to 34 ampere hours (Ah) and gross energy capacity from 7.1 to 11.6 kilowatt hours (kWh, net energy capacity: 9.4 kWh). 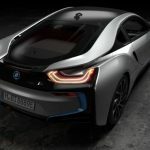 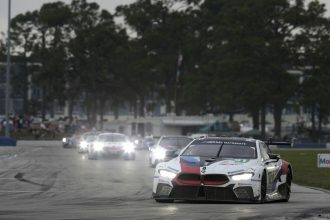 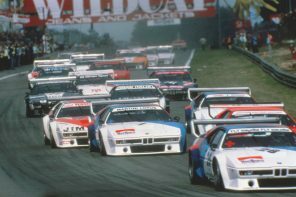 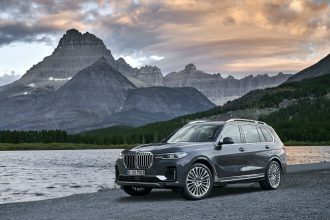 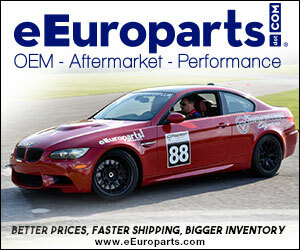 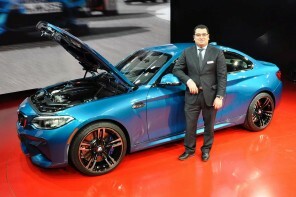 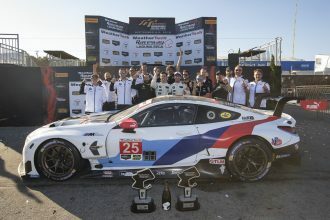 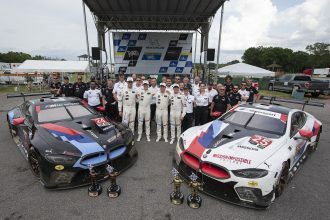 This advance is rooted primarily in advances made to the battery cell technology, which in turn stem from the BMW Group’s ever-increasing expertise in the field of electrical energy storage. 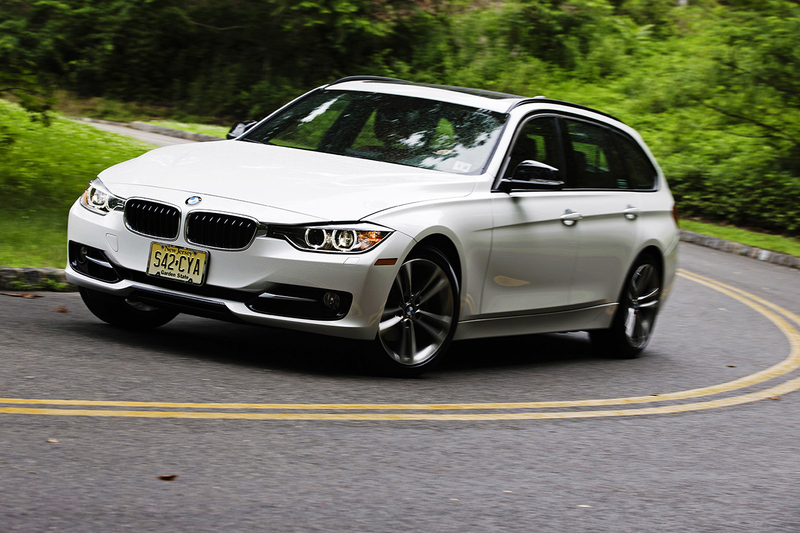 Maximized driving pleasure with intelligent energy management and hybrid- specific all-wheel drive. 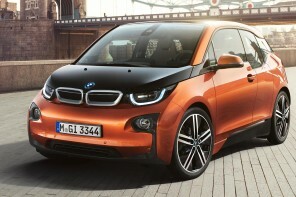 In hybrid mode, the electric motor provides a power boost to assist the engine when vigorous acceleration is required. The electric motor is also able to recuperate energy and feed it to the high-voltage battery on the overrun and under braking. 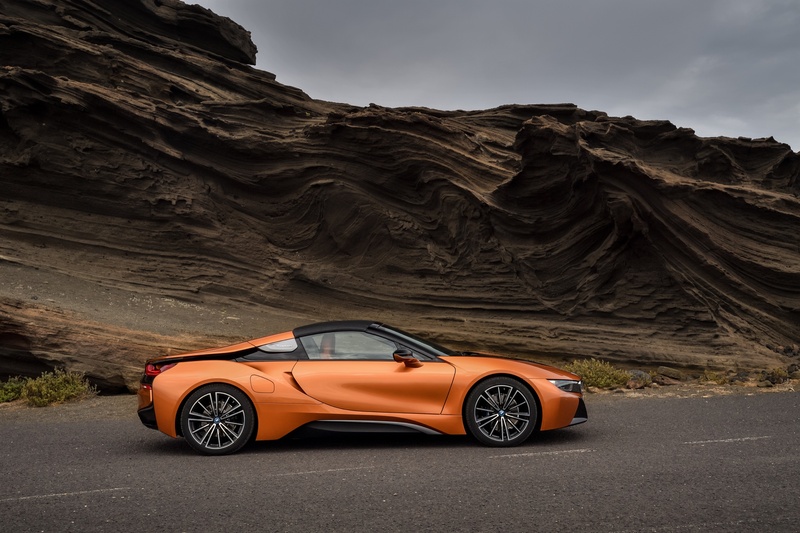 The gasoline engine’s high-voltage starter-generator can similarly generate additional reserves of electricity, thereby ensuring that sufficient energy is on tap at all times for the electric drive system in the new BMW i8 Coupe and first-ever BMW i8 Roadster. 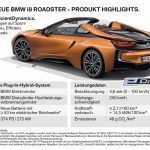 BMW i8 Roadster with model-specific chassis and body features. 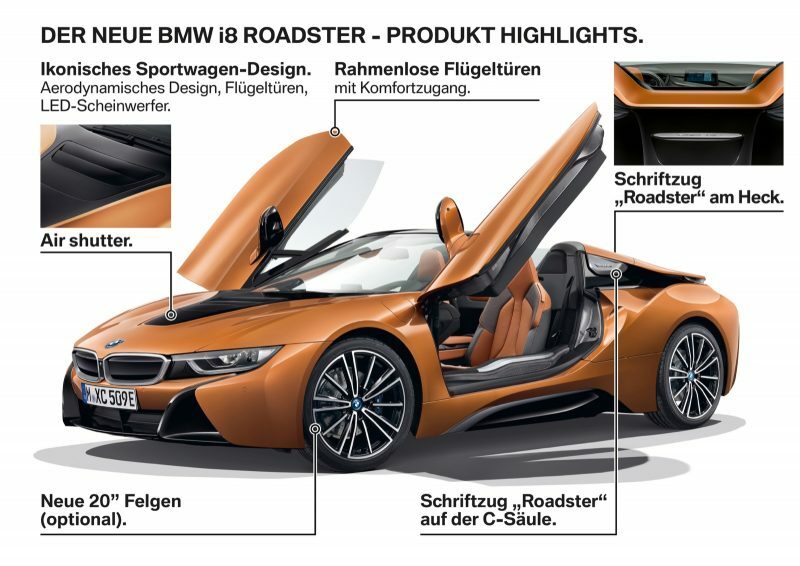 The high-end chassis technology in the new BMW i8 Coupe and first-ever BMW i8 Roadster is based on a double-wishbone front axle and a five-link rear axle, whose aluminum components have been engineered for optimum weight and rigidity using specific design techniques and production processes. 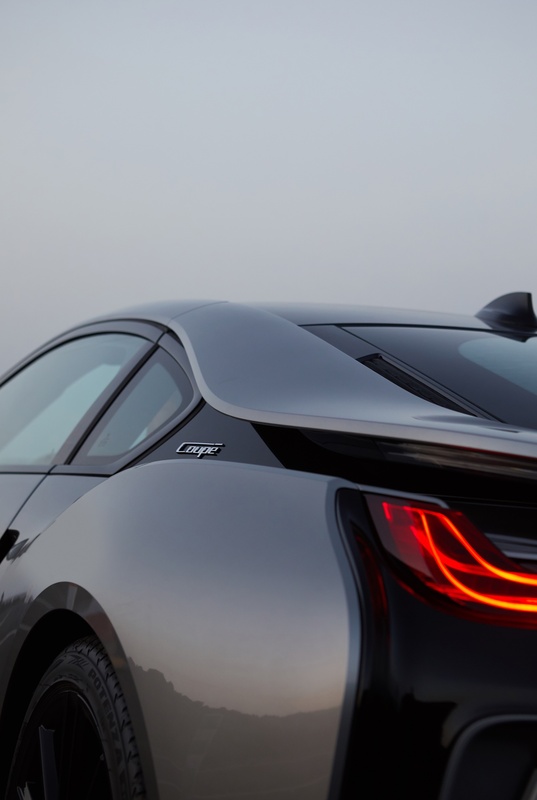 Also standard on both models is Dynamic Damper Control. 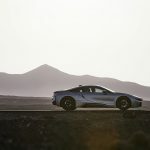 The bespoke tuning of the suspension and damping systems, the specially configured steering characteristics, a firmer roll stabilization set-up and precise tweaks of the DSC parameters together ensure the first-ever BMW i8 Roadster boasts all of the plug- in hybrid sports car’s hallmark handling and performance qualities. 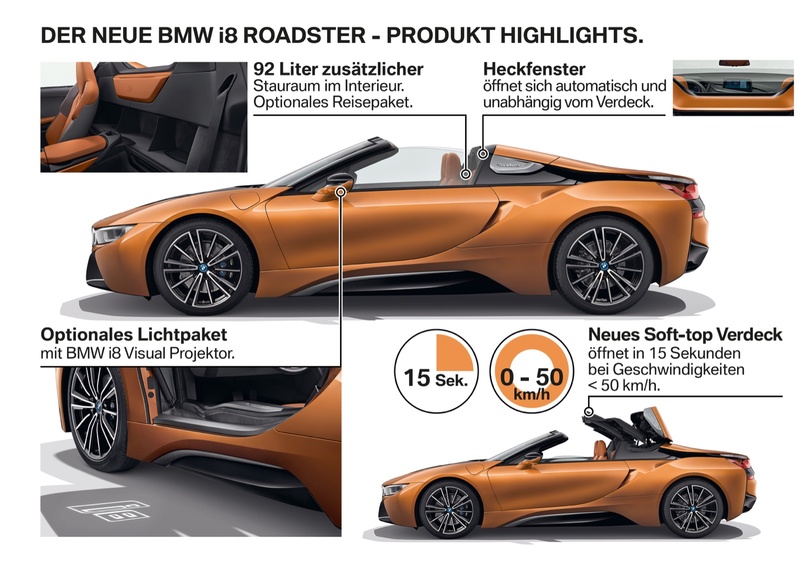 The approach of making systematic use of lightweight design measures has been meticulously adapted to the specific requirements of the Roadster model. 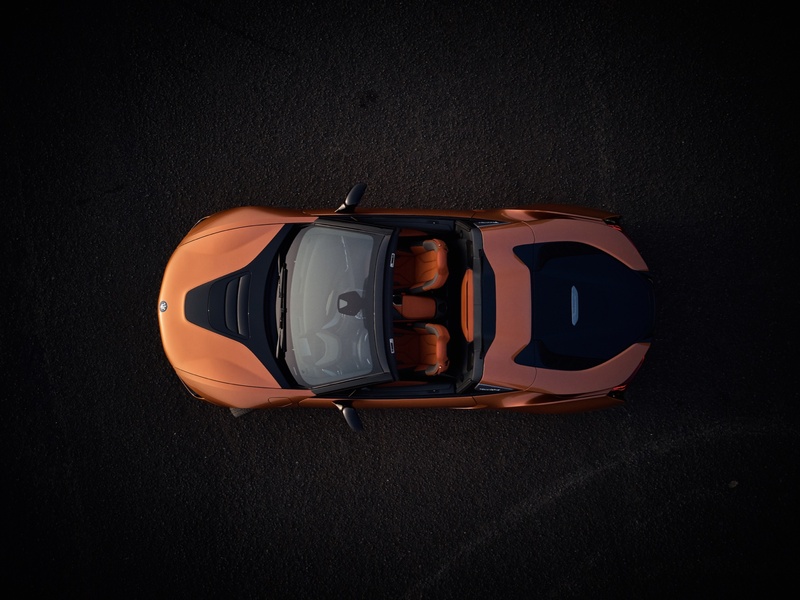 The open-top two-seater comes with newly designed frameless gullwing doors made from CFRP with an aluminum outer shell, while the windscreen frame is made entirely from CFRP. 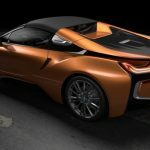 This ultra- strong high-tech material is ideally equipped to provide exceptional rigidity, maximizing the car’s occupant protection in case of a roll-over situation. 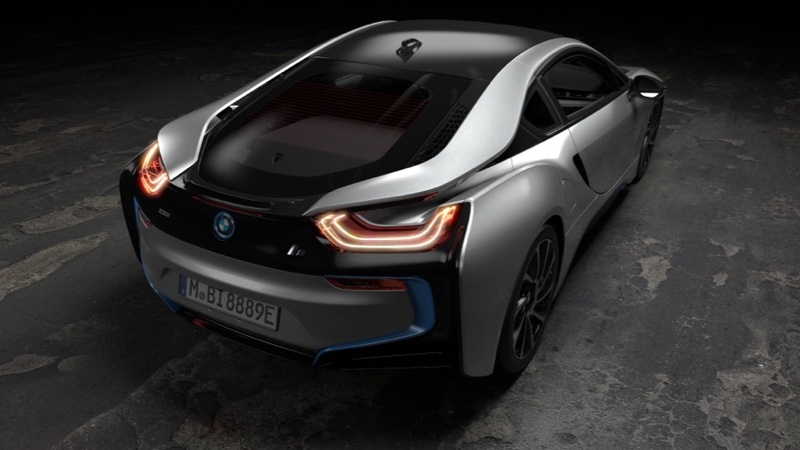 CFRP is also used to manufacture the side skirts with their extra-large cross-section. 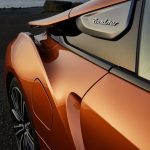 The skirts are a contributory factor in the body’s stiffness, as are the additional panels in the rear suspension and the specially designed struts for the front and rear axle. 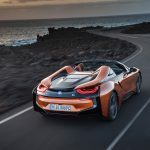 Thanks to the high-strength CFRP body, the chassis and body elements specific to the BMW i8 Roadster result in an extremely small weight gain when compared to other open-top models. 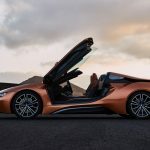 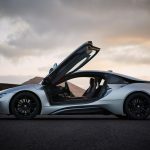 The unladen weight of the new BMW i8 Roadster stands at 3,513 pounds, just 132 pounds more in approximate terms than that of the new BMW i8 Coupe (preliminary figures). 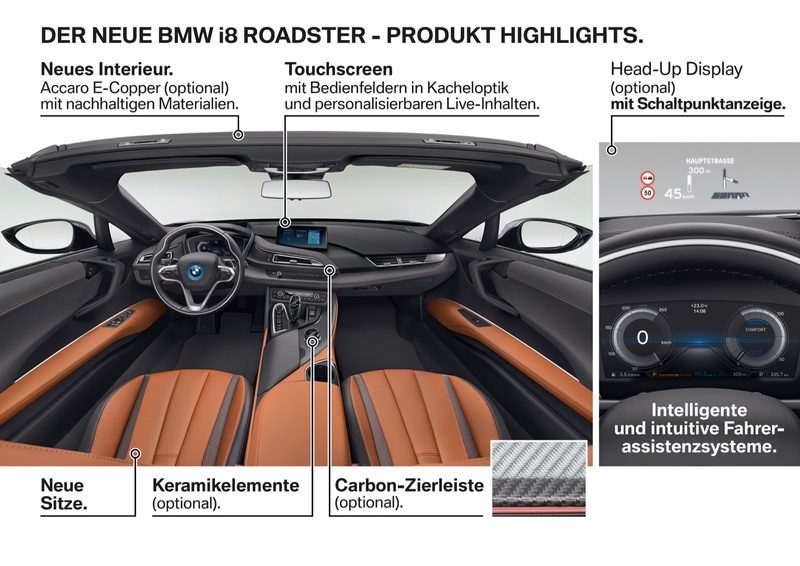 Controls, equipment, BMW Connected, ConnectedDrive and 360° ELECTRIC. 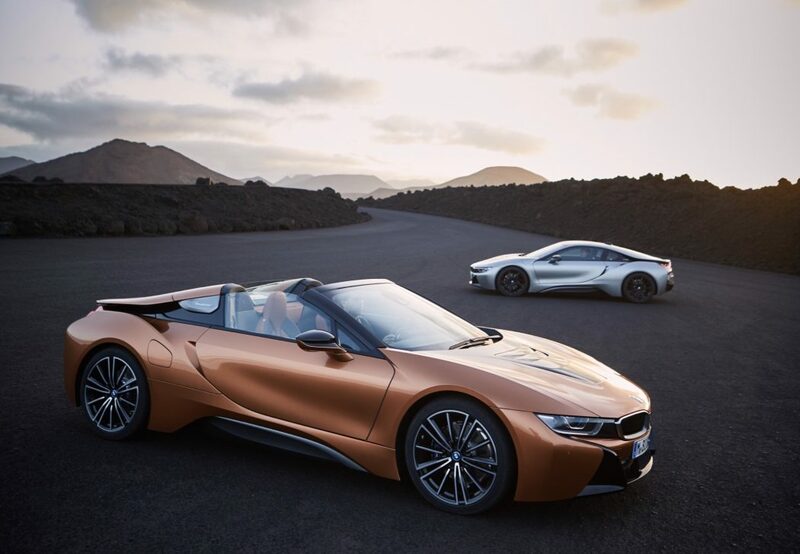 Both the display and control concept and the equipment of the new BMW i8 Coupe and first-ever BMW i8 Roadster serve to enhance their exhilarating sports car feel and the intense hybrid driving experience. 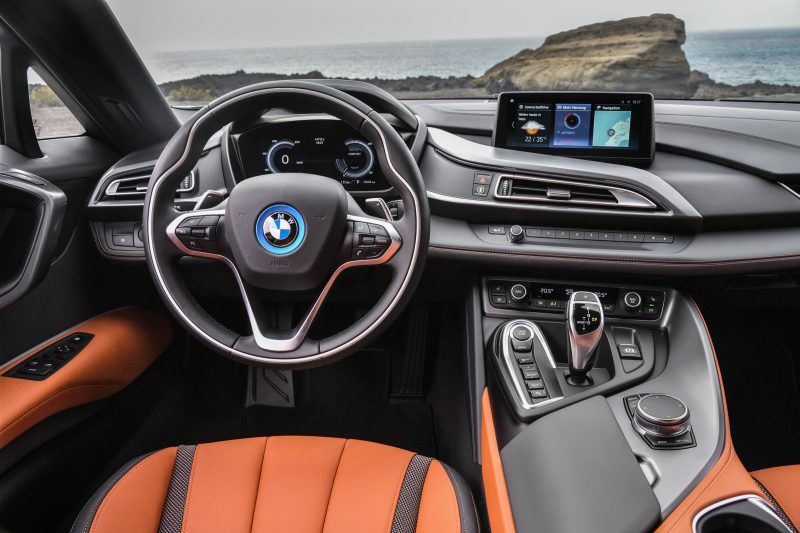 As well as its multifunction buttons, the leather sports steering wheel also comes with shift paddles for changing gear manually, while the standard heated seats for the driver and front passenger are electrically adjustable. 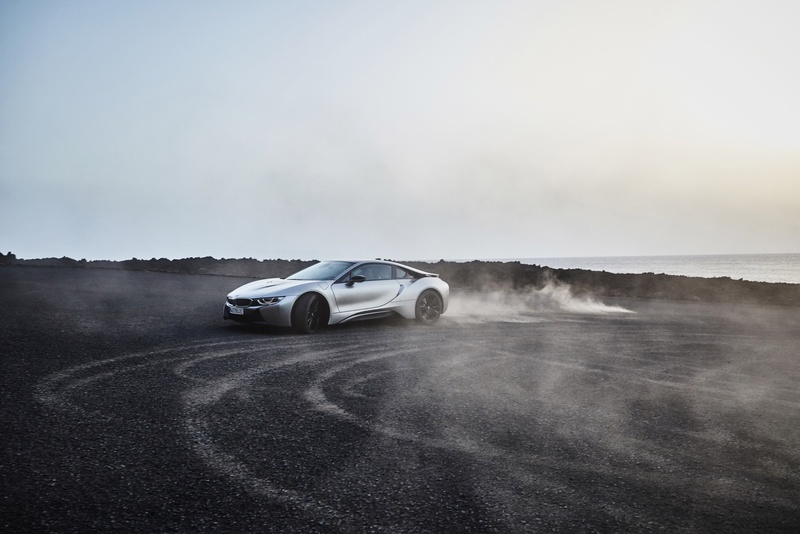 It is in SPORT mode that the intelligently controlled interaction between electric motor and combustion engine can be experienced at its most intense. 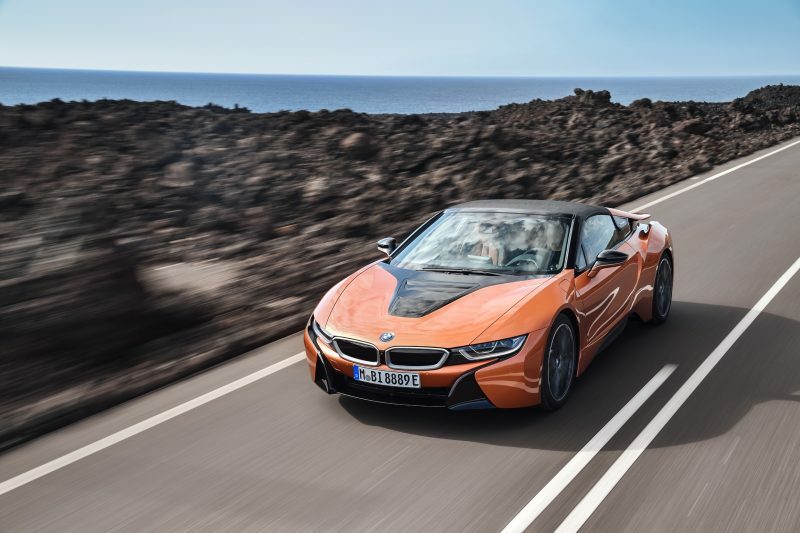 Both power units deliver extra- sharp performance, accelerator response is faster and the power boost from the electric motor is maximized. 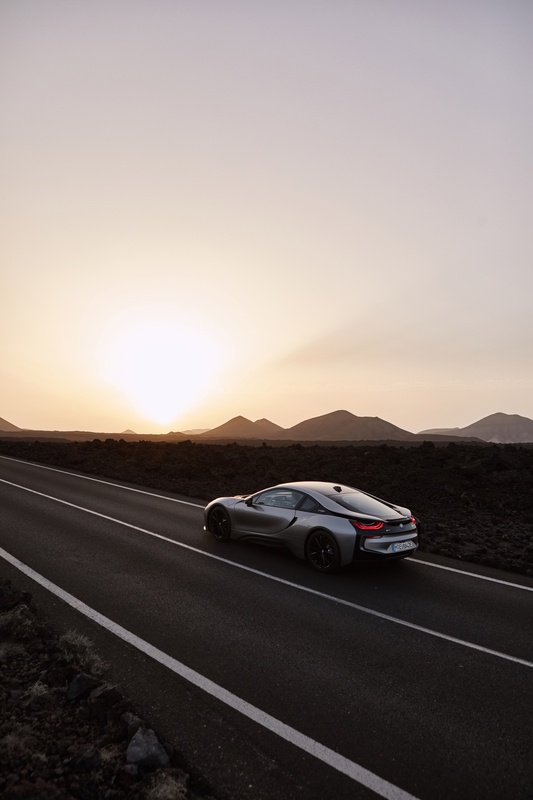 And to keep the battery topped up, SPORT mode also activates maximum energy recuperation on the overrun and under braking. 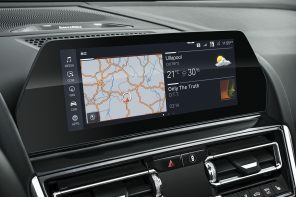 The intelligent energy management’s mode of operation can be visualized by calling up the energy flow graphic in the Control Display via the iDrive menu. Navigation system Professional and Driving Assistant as standard. 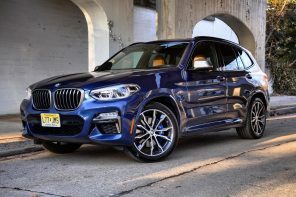 The Navigation system Professional, also included as standard, is controlled using the latest iDrive 6.0 operating system, comprising both a Touch Controller on the center console and an 8.8-inch freestanding touch screen Control Display. 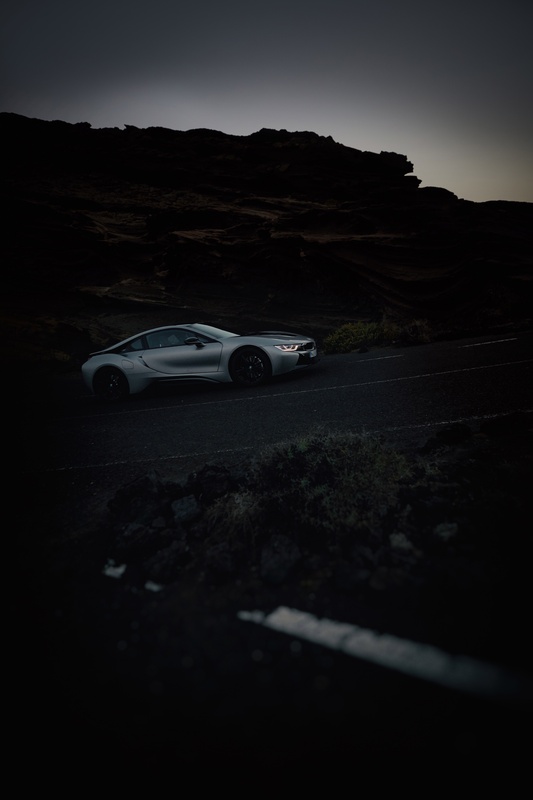 The main menu is now presented on the screen in the form of horizontally arranged tiles with a live mode. 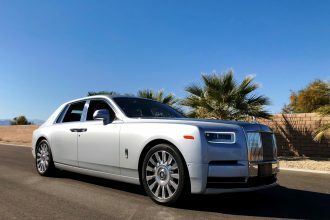 The standard audio system features a 12 speaker 360 W Harman Kardon HiFi system with HD tuner for digital radio reception. 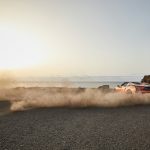 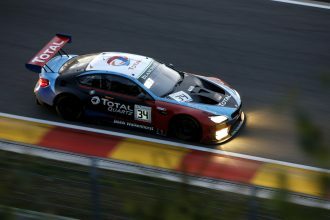 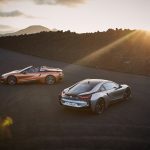 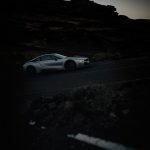 The enthralling driving experience offered by a plug-in hybrid sports car is enriched by the digital services offered by BMW Connected and ConnectedDrive. Intelligent connectivity between vehicle, driver and the outside world paves the way for remarkably efficient mobility, increases comfort, expands the infotainment offering and helps with individual mobility planning. 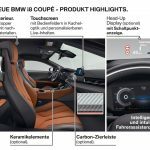 360° ELECTRIC: new charging cable, BMW i Charging Station. 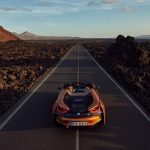 360° ELECTRIC is a range of products and services that help make electric mobility a convenient, everyday experience. 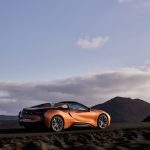 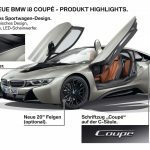 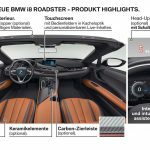 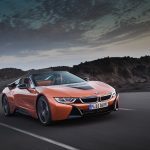 The functionality of the standard charging cable supplied with the first ever BMW i8 Coupe and first-ever BMW i8 Roadster has been optimized and includes a temperature sensor. 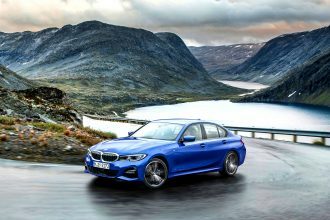 Charging at home is extremely user-friendly thanks to the BMW i Charging Station which can supply 7.2 kW of power to charge the high-voltage battery and can fully charge it in under 3 hours. 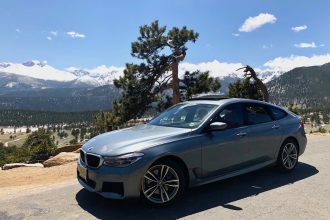 Drivers with a registered ChargeNow card have unrestricted access to the world’s largest network of public charging station BMW Original Accessory: BMW TurboCordTM EV Charger. 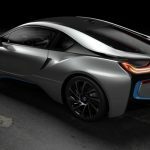 Now available as a BMW Original Accessory the BMW TurboCordTM Electric Vehicle Charger can be purchased at certified BMW Centers for $499 MSRP. 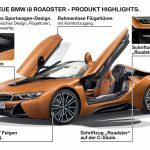 This premium charging solution provides BMW i and BMW iPerformance drivers with the ultimate charging experience – flexible dual-voltage (120 V / 240 V) capability and nearly three-times faster charging – all in the smallest, lightest UL-listed portable charger available. 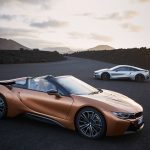 The BMW TurboCordTM EV Charger components have been specifically engineered by BMW to meet BMW Group standards and requirements, featuring a convenient 20 ft charging cord, and provides two chargers in one. 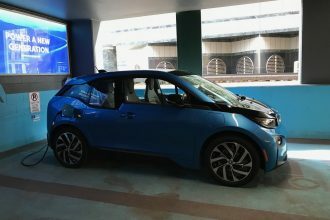 Level 1 charging is readily available when plugged into any 120 V outlet and it also allows customers to charge up-to at 3.6 kW, nearly three-times faster than the standard occasional use cable (OUC) when used with a 240 V outlet (NEMA 6-20). 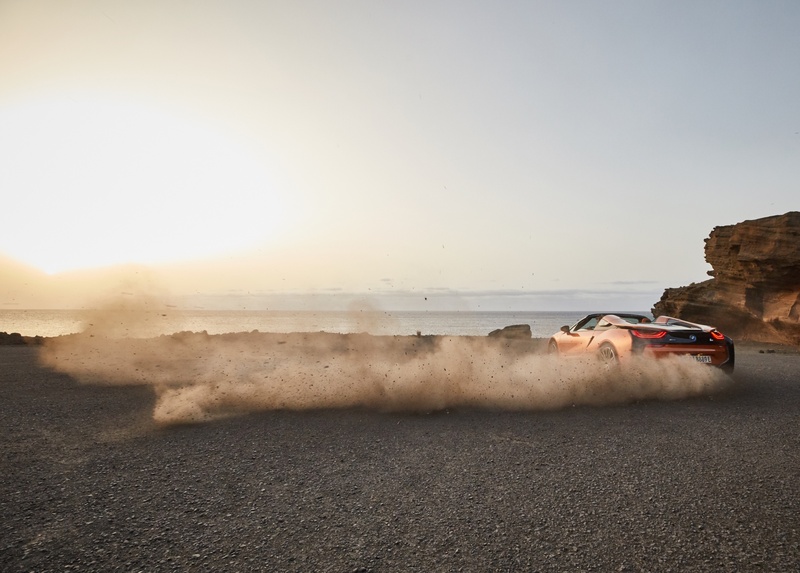 Also integrated are such state-of-the-art safety features as unit and plug temperature monitoring, automatic shut-off and a rugged, waterproof, submersible enclosure (NEMA 6P) that enables users to safely and reliably charge indoor and outdoor.